2008 is officially here and I wanted to wish you all the best. I hope this year will be a good year for learning Spanish. It should be, since the UN has declared 2008 the international year of languages in an effort to promote unity in diversity, and global understanding. Thanks Simon for that link. So what are your plans and goals for 2008? I’ve never before participated in a blogging meme (the word’s also meme in Spanish too). But how can I get out of it when Osman tags me and awards me with the “Thinking Blogger Award“? If I have made some of you think with the things I discuss here, I have realized my goal. Now for the five people who have recently made me think with one of their blog posts, in no particular order. The Language Nerd, now known as the Learning Nerd has made me think with some of her posts about drawing. I especially like the English weekly word, which has also made me think. Zach got me thinking one day with his post about keeping backups. It’s something we all know, we all try to do, but don’t always do enough. Enough said. Lynneguist constantly makes me think with her thoughtful posts about American and British English– Always extremely interesting. In addition to lots of interesting information about Spain, Ben Curtis also makes me think– for example, the series discussing the relative rudeness of Spanish people. I’ve saved the best for last. Miss Profe, a Spanish teacher, really gets me thinking a lot with posts like Let it all hang out, Afraid and Abolish the “N” Word. So, tag, you’re it, I guess. I’ve done lots of translating and never blogged about it, but I just recently finished a translation for a fairly new website that’s so cool I’ve got to tell you all about it. Although I may not be sure what the name Diarised means, besides having something to do with “diary”, I do know the service they offer sure looks promising. When I first saw it, I immediately realized how helpful it would be. What you can do over there is you take a meeting you need to set up, name it, select a bunch of possible dates/times for the meeting and input the names and email addresses of all the people you want to attend the meeting. That’s basically it. The website sends out emails where each person picks the time/date the suits them the best. You can then see what everybody picked and confirm the time the suits the majority. It’s really pretty slick and you can do all that without even signing up for anything. But probably the coolest feature is the Spanish translation. 🙂 I hope you like it. Well I didn’t make any New Year’s Resolutions, but if you all will allow me to make one now even though it’s already Jan, 3rd, I resolve to write some more posts here. I can’t believe I only posted one single time in the month of December- what a shame. In the coming days I’ll make a more concerted effort to chronicle my Spanish learning journey here. I’ve had fried bananas before, but I hadn’t had stuffed bananas (tortas de plátano) before today. Apparently this is something made in some parts of México. 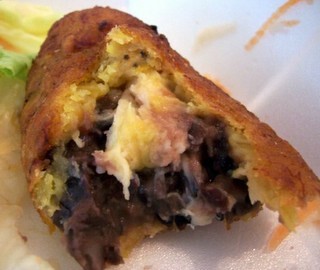 Its just sliced bananas wrapped around some refried beans and some white cheese thrown in the middle for good measure. When it’s all ready, just drop it in a pan and fry until golden brown. Enjoy with a salad. Anyway, that’s your recipe of the day. I even snapped a picture for ya’ll. Enjoy. The combination of banana with beans and cheese sounds kind of weird, but you should try it. It’s actually pretty good.